– cleaning up lots of little things in gameplay. – scads of optimizations here and there (the game is liquid-fast on any modern PC, but handhelds like the iPhone are effectively like a decade-old desktop computer, and some aspects of the game needed to be rewritten to run quickly on that). An upside of this is that it considerably widens the scope of computers that can run this – practically anything with just basic OpenGL support, 40mb of free ram, and a >500mhz processor can run it just fine. 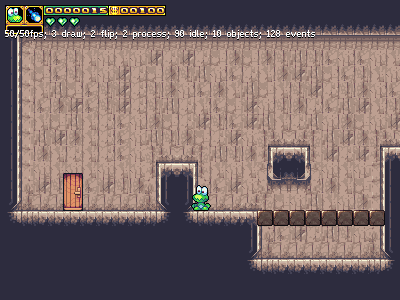 – additional cave and forest levels, mostly thanks to “shadowmaster”. – making locks into visible objects, and adding functionality to have to physically grab a key and drag it to the lock to unlock it. 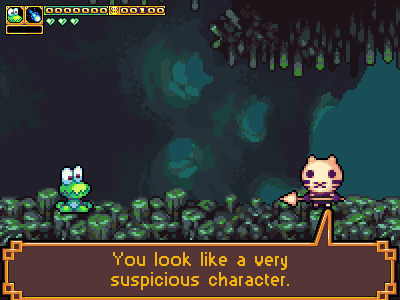 – working on a few new cutscenes, and polishing up the game’s ability to handle boss battles. – Last but not least, we’ve overhauled how we do dialogue – rather than having portraits for individual characters, we’ve switched to animating their sprites to convey emotion. We now zoom-in the game screen to make the animations visible, and we’ve changed the speech boxes to (stylized) speech bubbles to indicate the speaker. This entry was posted on Sunday, April 11th, 2010 at 7:57 pm	and is filed under Uncategorized. You can follow any responses to this entry through the RSS 2.0 feed. Responses are currently closed, but you can trackback from your own site.